Families with a special needs student may dismiss homeschooling because of how helpful the IEP developed in public schools is for coordinating all the services that their special needs student gets. Now, with the IEP GeneratorTM any parent can write an IEP for use across all services. 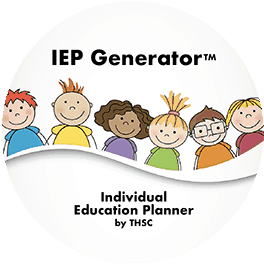 The IEP Generator produces a professional-looking product completely customized to your student. Can I Write My Own IEP? An Individualized Education Plan (IEP) is the form that documents the educational goals of your child with special needs. It’s an official document, but there are no “official requirements” for creating an IEP. So, yes, you can write your own IEP! You don’t need a degree in special education or social work. You simply need to know your child and know how to set realistic goals for your child. With the IEP Generator, it is simple to keep track of specific testing records, accommodations and modifications, and specific learning goals you set for your child. Plus, this document can be used when working with therapists, doctors, the college testing board and higher institutions of learning. Our IEP Generator takes the huge task for writing an IEP and breaks it down into bite-sizes. You just have to answer one question at a time. When all the information is input, we format it and provide you with a downloadable PDF form. Your information stays current in our system for one year. During that time, any time you need to make changes to the IEP, you simply modify the sections that you need to change and then you can print the modified IEP. If you sign up for auto-renew, your IEP information will remain in our system as long as you renew. That means that creating the following year’s IEP is much quicker and easier. You can build on the first IEP that you created for your child’s entire education. Most of this section is self-explanatory. To prepare yourself to complete the section entitled, “Thorough summary of the child’s current academic and functional performance levels,” review these resources below. Here is where you keep track of tests and dates relevant to your child’s learning challenges. You’ll just log them here, but be sure to keep copies in case therapists or other service providers request to view them. In IEP Generator development section, you will click “yes” to subsections that apply to your student. Under applicable areas, you’re prompted to address a specific issue in your homeschooling program (such as transitions planning or specific strategies to aid in communication or accommodate physical limitations). The most dynamic aspect of the IEP is its goals. In this section, you will input specific academic and functional goals for the school year. Check out these resources on how to write measurable IEP goals. Get one full year of IEP Generator access now for just $110! Make modifications throughout the year for free. More than one special needs student in your household? Pay only one fee per family. Create a professional, legal document that will coordinate services from all the members of your student’s habilitation and educational team. Take charge of your student’s IEP! You as the parent will decide what is and is not included, in consultation with other service providers. Ensure all the accommodations that your student needs now and in all scenarios are listed in this important legal document. Homeschooling students with special needs is legal in all 50 states. Also for use with IEP for private schools!